Reputed Multi slate scheduled Co-op. Bank having completed 104 years.with presence in 5 states and a business set up of over Rs. 13,000 crores is looking for dynamic & smart officers. Experience:3 to 10 years experience in bank or financial institution is essential. Age - Not more than 40 years. Salary commensurate with best in the industry. 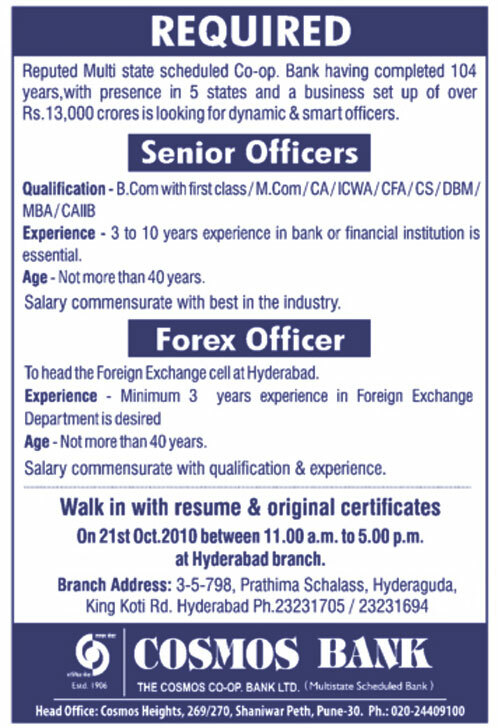 To head the Foreign Exchange cell at Hyderabad. Salary commensurate with qualification & experience. On 21st Oct.2010 between 11.00 a.m. to 5.00 p.m. at Hyderabad branch.